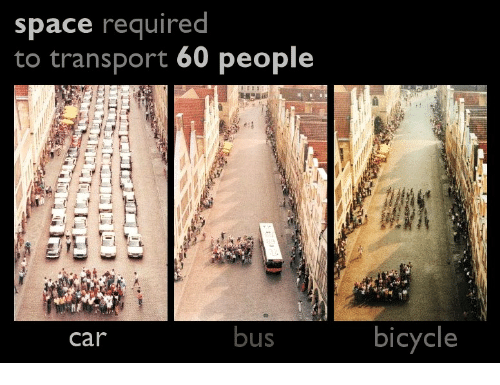 The only possible illustration for this post is this classic illustration of how much space people take up in various forms of transportation. The only possible illustration for this post is this classic illustration from Müenster of how much space people take up in various forms of transportation. 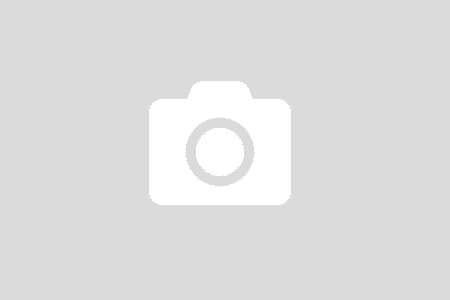 An earlier version of this post compared my transportation experiences in Spokane. After living in a much larger population and a more urbanized environment for over five years, I wanted to revisit the topic of why you might find biking and transit better choices than driving, once you make the mental shift. Young People: Given the statistics about the decline of driving among young people, if your town wants to prevent “bright flight” — smart and creative people leaving for places that are more to their liking — you’ll invest in bicycle facilities, walkability, and reliable transit service. Without those, you’re going to lose the next generation in the years to come. Families: Do you want to raise your children in a place with statistics about kids being struck and killed by drivers as they cross the street on the way to school? Traffic calming, speed management for safety, streets that are people-friendly rather than car-friendly — all those elements matter greatly if you want to keep saying your town is a great place to raise a family. Elders: Not only that, you’re not going to make those lists of “Top 10 Cities for Retirement” without a multimodal transportation system. AARP has made walkable, liveable communities a policy priority for good reason. 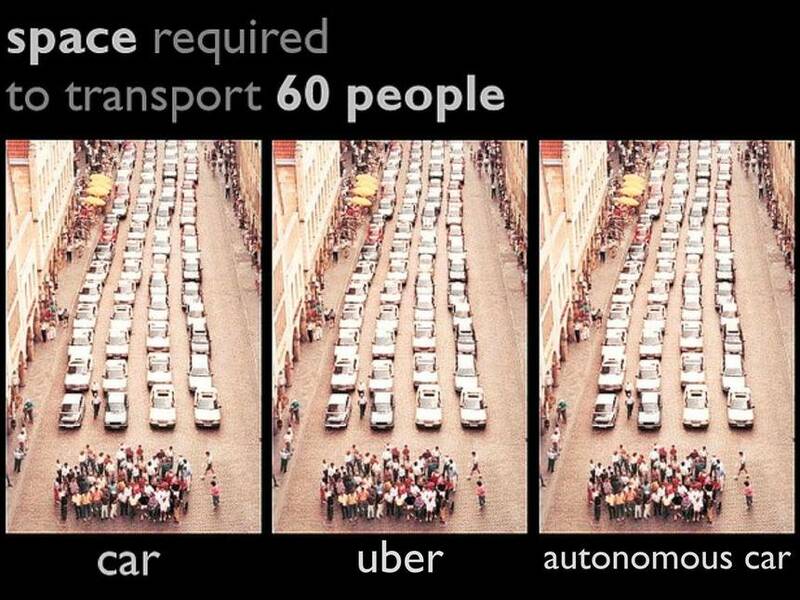 As you have to give up driving you don’t have to give up transportation independence if you are comfortable with the other modes and if they’re available to you because your community chose to make those investments. I can’t tell you how many times, though, I’ve said something about the data on this to a person in a position of power — most often an older white man wearing a suit and tie — only to hear that his kids or his friends or his parents aren’t like that. They want their suburban rancher with the two-car garage, by golly. I always wonder how many of them have actually discussed this topic rather than simply projecting their own choices and preferences. When you have a lifetime of habit under your seatbelt, you can’t imagine changing, so you can’t imagine anyone else changing. I also would guess perhaps they’re counting on their aging parents using Uber or Lyft to get around once they stop driving (if they’ve really thought about this at all), rather than finding themselves personally on the hook for making sure the folks get to doctor’s appointments, the grocery store and the like. They must be someone whose parents can afford that. That’s not going to be true for every older person (not all of whom have available adult kids to help out either). By 2030 one out of every five people in the US will be age 65 or older. We need solutions for everyone, not just for people with money or family support systems. Even before moving to Seattle I’d come to view driving as a nest of factors that cost me time, money and frustration. That hassle factor for driving is now multiplied by at least 4.312092–which is how much bigger the King County population of 2.117 million is than Spokane County’s 490,945. I think I could make a decent argument for making it an exponential factor rather than a simple multiplier, given the topography of the Puget Sound region and the way that funnels a lot of drivers into relatively few channels between mountains and water. Herewith, my current use of bicycling and transit compared with what I see for the drivers I pass and what I experience in my preferably very limited driving. Your mileage may vary. 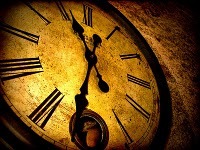 There’s just as much time as you think there is. Bike: If I ride to work it’s ~8.5 miles and takes me about 45 minutes very predictably and reliably. I’m moving the entire time and thus have a constant sense of progress toward my destination. I can race myself a bit and try to beat my best time or experiment with a different route. Transit: When we bought a house we made sure it had bus service to downtown and I have my choice of a couple of routes for my usual destinations. The One Bus Away app is my constant companion, telling me which buses are available near my current location and how long I have to wait until the next one arrives. It’s a six-minute bike ride to the stop, then about 35 minutes on the bus, which gets access to the HOV lanes and thus moves past drive-alones stuck in traffic, and roughly two minutes by bike from the stop in Pioneer Square to my office. Car: I have no idea how long it will take me to drive anywhere. Despite Google Maps’ attempt to show distance as a function of time with a comment about whether I’ll be facing light or heavy traffic, they can’t know in real time that a collision just blocked two lanes and everything has ground to a halt, or that the Seahawks fans are flooding out of the stadium and thus it’s a complete snarl near my office. I thus can waste a lot of time in one of two ways: Leaving ridiculously early to allow for traffic problems and being surprised at how well the traffic is moving for a change, or sitting in that traffic because it’s not moving. Parking costs time, not just money: When people say driving is faster they’re often counting only the actual travel time inside the vehicle. That’s not your total transportation time budget, however. No matter what amount of time it takes to drive somewhere I need to factor in the time to find, pay for, and travel from a parking place to my ultimate destination. While downtown Seattle has a lot more available parking any time of day or night than people think (it’s inside those parking structures, not right in front of your destination) it’s still a hunt. And I say from sad experience that you need to pay attention to the signage telling you a garage closes at a certain hour and if your meeting gets out late it’s going to cost you big bucks to have the gate opened. Bike: I feel so strong! I’m flying along at almost 20 miles an hours and doing it all myself. This is exhilarating! And I’m not even going downhill. Well, not much. Car: Go fast in Seattle traffic? Ahahahaha. In addition, I now know so much more about the toll that speed takes if I were to hit someone (chance of death goes up dramatically with each increment in vehicle impact speed) that I’m honestly not interested in going very fast. Bike: I’ll just park in the rack (or hitch to that sign) and be inside in a jif. When I come out, no effort needed to remember where I parked. Transit: Parking? What parking? Not my problem. If I have to wait for a bus 20 minutes, that’s just right for me to squeeze in one errand before the bus gets here and I head home. Or I can read my book and the time will fly. Car: Shoot, there’s nothing close to my building. I’m going to have to look for a spot and that’s going to make me late to my meeting. Wonder if I have change for the meter? How far will I have to go before I find something? Which street has the entrance to that parking garage I can see from here? I’m going to be late. 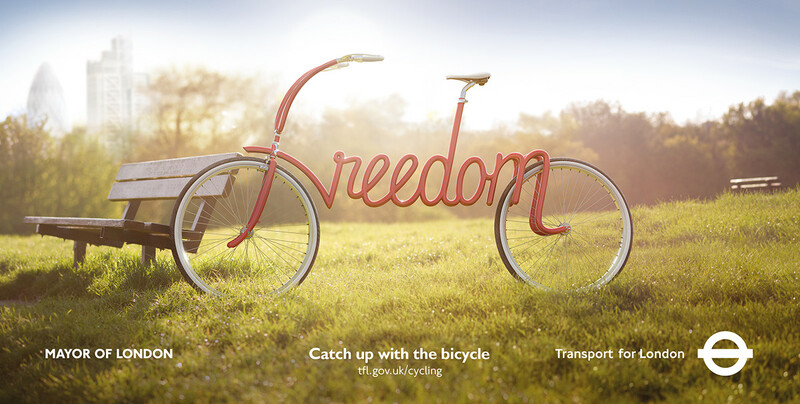 Bike: The bicycle epitomizes freedom. I have not only the personal mobility and freedom of riding, I have the freedom to choose alternate routes easily or to switch from biking to walking or transit. My bike gives me the ultimate transportation flexibility. Transit: A different kind of freedom. I’m not free to make the bus driver take me to my front door but I’m free to choose different routes to reach different destinations and see different things along the way, and I’m definitely free from the tensions and frustrations created by driving. Brain freedom, baby — how often do you get that? Bike: I love riding my bike! Car: Happiness? What does commuting have to do with happiness? This is the worst part of my day (and there’s research to support this). Oh, and all the things I’m saying about driving? It wouldn’t matter if I drove a shiny new electric vehicle or sat in an autonomous car rather than our 20-year-old minivan. I’d still be stuck. Jon Orcutt of Transit Center updated the classic space comparison. You could label any of these three batches of cars “electric” and the point remains. Treehugger piece helped me find the image I knew I’d seen on Twitter. Original post inspired by Jonah Lehrer’s post and comments on commuting and happiness, Matthew Yglesias’s post on congestion pricing, and the smell of roasting coffee on my ride to work. This update inspired by the poor souls I see trapped on I-5 as I ride happily along. 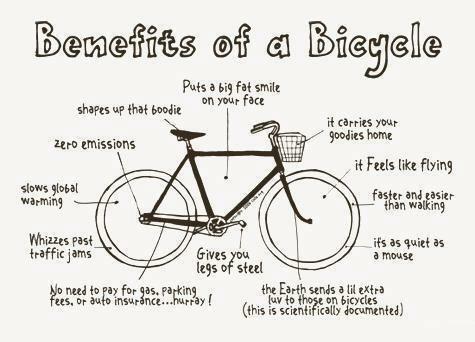 “Benefits of a Bicycle” graphic from C.I.C.L.E., which will happily sell you a T-shirt with this image. What does driving give you that you don’t believe you can have if you choose to bicycle or take transit? Whatever it is, have you talked to someone who bikes or buses to find out how they handle that? * I firmly believe you should support your local bookstore if you have one. This Amazon Affiliate link is in case you don’t.